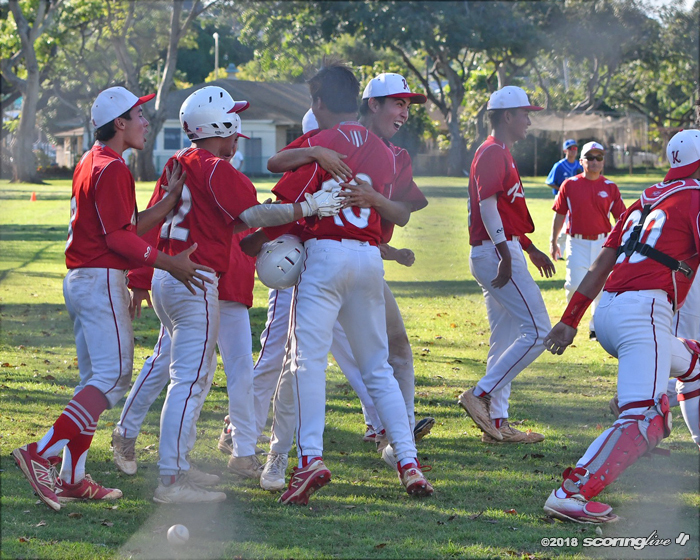 FALCONS BEAT KAILUA 2-1 IN BASEBALL TO MOVE INTO A TIE FOR 1ST PLACE IN THE EAST! KAHALA - Jarrod Kaneshiro scored the winning run from second base on a throwing error with no out in the bottom of the ninth inning and Kalani edged No. 7 Kailua, 2-1, Wednesday at Kahala Community Park. The Falcons (6-2) pulled into a tie for first with the Surfriders (6-2) with four games to play in the Oahu Interscholastic Association Division I Eastern Division with the victory. "We're just trying to stay ahead of Kaiser and Moanalua (fourth and third, respectively in the East) and try to get the bye," Kalani coach Shannon Hirai said. "Whether we win the division or not, the bye is the important part."